Took a walk at the Tanglin Core of the Botanic Gardens this morning. Hardly come to this part of the garden. Photos taken with my Galaxy Ace. "This will go viral one" ROFL. So good, I don't know what to say! 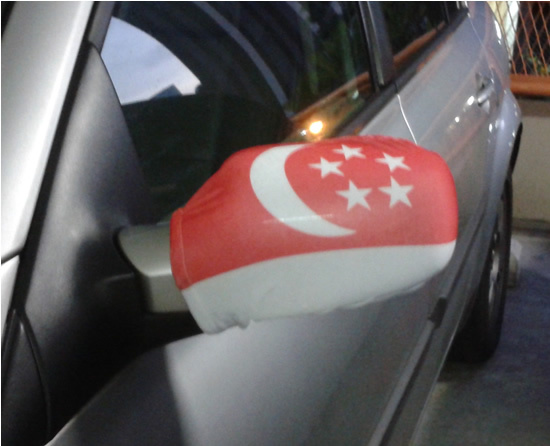 Celebrating Singapore's 46th Independence Day. Thanks Vivien for sharing. And the redoubtable performance by Kit Chan last year. I am still watching for and starting to weary about this: who will be able to offer himself as a unifying figure for the nation? Doesn't look like Tan Cheng Bock and Tan Kin Lian are capable of that. To unify is to be able to bring on board opposites. Instead both are being anti-PAP using being independent as the excuse. How unifying can they be when in trying to prove their independence they create greater division? Forget about the people for a moment. There are millions of us. Let's begin by looking at their proxies despite their imperfect representation of the people - the PAP and the alternative parties. A unifying president will be a person with the gravitas and moral authority to be respected by the entire political spectrum. Instead what I am witnessing are two Tans pouting their credentials of opposing the PAP to be reliable independents when the greater need is to unite the people with their independence ranking lower. To me both of them are just playing to the vocal corridor to win votes. Are they forgetting that beyond the noisy ones, the larger quieter majority also vote? As a leader of leaders, you have to choose and lead the conversation and not let the vocal people take you everywhere. You fall into this trap before you are President, you will also when you occupy the Istana. As we enter August, I will be watching how Tony Tan is able to be that unifying personality. I will be asking myself if he can be trusted to act at least as independently as Ong Teng Cheong had put the nation's interest above the ruling party's. Meanwhile Tan Cheng Bock is filling my facebook wall with bad reruns of old movies, making me feel like a slow learner needing to sit through the lessons repeatedly. It is starting to turn me off and wifey has also complained the same. It appears that the two Tans are not able to rise above politics. I credit them for trying but obviously they do not have a sufficiently deep and clear idea of what above politics mean. Both are good men, but I wonder if they are good enough to be President. Now I shall pay more attention to Tony Tan, whom I have previously ignored. I had seen him as hand in glove with the PAP for too long to be able to tear himself away from their mindset. Perhaps I have also thought about this wrongly. May be it is not about jettisoning PAP thinking but enlarging it to incorporate the alternative parties thinking too, especially the WP. If the President does not have a mind broad enough and a deep spirit to go with it, how can he even craft aspirational speeches to unify us, not to mention people building initiatives and plans? He cannot dwell on the hows and whys of today as that is the government's job. His job is about connecting today's decisions with future consequences, with what we want to become; not materially but as a people with families, peaceful coexistence between different races and religions; about values and evolving the Singaporean identity. It is about continuing where our first President Yusof Ishak had left off. The one who went out every day to urge people of different races to get along. The job is not finished. It has been made more difficult by the mistakes of the PAP government which had imported foreigners in a hurry. This is not the place to detail their many mistakes, which had seriously marred their otherwise excellent track record. I just found Microsoft's spoof on Gmail courtesy of Cnet. Guess what? I am going to use even more of Gmail. I am going to encourage more people to switch to Gmail after this! Why on earth do I keep "Blogging for Myself" open but without publishing and promoting it? Because in this new environment privacy has a totally new meaning. The lesson to take away is don't live a life which can be embarrassed about what is private becoming public. Get real.....I am waiting for the Chinese government to learn this big time sometime. That day must come. Just don't know when. The Singapore government is learning this too, albeit not as quickly as some of us might wish. Of course Microsoft had misrepresented Gmail here. If you bought Microsoft comedian play on Gmail, you just passed the stupid test, i.e., you are stupid and fortunately only temporarily. I once lived in that territory myself. May be I was an early and fast learner but give everyone a chance to get out of there. Democracy, one person one vote needs it. A free society is built on an educated and informed people. Your economic survival depends on your education and skills too. Economic progress will increasingly be circumscribed by how free and responsible your society is. There is Gmail but there isn't such a thing as a Gmail man until some unlucky time. Then he doesn't appear as a mailman. He and could very well be a She, is likely to be a prosecutor or more likely your spouse, God forbid you have been cheating on. Microsoft advert against Gmail is an insult to all computer users intelligence and so Fox TV in essence. As entertainment, I thoroughly enjoyed it :-) but will never pay for it. That is the message to send to Rupert Murdoch. .
:-( Problems with the Galaxy Ace (Prior line inserted for a search test later). This has happened a few times already. By chance, I discover that I can't get the phone to wake up and is forced to press down and hold the on/off switch. Prior to switching it off, I tried calling the Galaxy Ace from a land line. It responded with a ringing tone on the calling phone but my Galaxy Ace was silent when it ought to be ringing too. To double confirm the problem, I switched off the Galaxy Ace and made a call to it again. This time the telco returned the correct message that the subscriber is unreachable. Not good. Got to monitor this. Hard to get service if the problem is intermittent. Recently the phone camera has also freeze up unusually often. Don't tell me I have to return the phone to factory settings and build up from there again. Wonder if there is an offending app. Phones are getting as unpredictable as PCs. Dear GOPs, especially the Tea Party group. When you have caught religion, you must lose your common sense. You will try to bend the world to your view. Failing which, naturally so, you will figure a way to see the world through the lens of your religion of the political economy. You will look cravenly stupid but yet that cannot redeem you because you will keep the company of like minded idiots to feel secure. As someone outside the USA, I only hope that enough Americans will soon realize this and oppose you. The world is bewildered, even frustrated with America. I have come to realize that this is just America. She is so unlike the rest of us and we often make the mistake of imposing our worldview on her and imagine her to be if we had her resources and position. Closer to home Lee Kuan Yew was especially prone of telling them what to do. We fail to recognize it is better that our wishes about her not come true because we are failing to see the monster that it would become. She is a perplexing mix and strengths and weaknesses, assets and liabilities; the messy checks and balances of power; our faith that they will rise to the occasion if presented with a Sputnik Moment, that they are accepted as the world's leader, even if grudgingly. I wouldn't fear America because I know if we are smart, we can find a mutually profitable way to co-exist independently. On the other hand, the Chinese are to be feared. You will need Zhuge Liang's wits around them. That's impossible for Singapore. We are just hoping that they will remember us as best friends to their rise to world power. As per Chinese culture, we hope they would be friendly to our limited interests. This was Lee Kuan Yew's diplomatic masterstroke, but it isn't enough. Every year, we have to continue to be relevant to China. They will be watching our attempt to create a First World Parliament with much interest. If we are lucky to have another LKY, I am afraid we have to bury the old one first. That's life. And of course he wouldn't be Lee Hsien Loong or his two deputies. For my children: Why the President must be beyond Politics. By now my kids are old enough to have the experience of looking at cells under a microscope. What a shock for them to discover that it was totally different from the pictures they see in their text books. There is a yawning gap between theory and reality. Teachers focused on meeting the requirements of the syllabus do not bother or have time to close the gap of this reality distortion experience. What a pity. Repeat this experience over and over again across all subjects is what Mark Twain had warned us about schooling and education. We do not have many Mark Twains just as we do not have the Wright Brothers, the Einsteins etc., In fact, too many who were only schooled cruise through life thinking they were educated. Some of them had the misfortune of losing a pile buying Lehman bonds. The government conveniently ignore the schooled-educated dichotomy. MAS knew better but chose to leverage the ignorance of the investing public for the "larger good of the nation" in support of public policy. Tan Kin Lian did them a service trying to help them. I witnessed this situation also in the unexpected number of comments in my earlier blog post on why an activist EP would be a menace to us. I think it is useful to explain to my kids who are too young to understand issues of the political economy that this is just another but more abstract example of the cells pictures in your book to the one under the microscope. Using the allegory of the Roman Catholic Church for the EP and the Cabinet is like looking at pictures of cells in a text book. What might real life of seeing the same object under a real microscope be like? An article on Bernanke role in the ongoing debate to raise the US debt ceiling at Bloomberg is instructive: See "Bernanke May Need to Stay ‘Above Politics’ in Debt Standoff"
The US and the Philippines have executive Presidents, but every nation needs someone to perform the role of the constitution monarch or head of state. In the US, this role is distributed and opportunistic. Bernanke is the man of the moment at this time. In the Philippines, Cardinal Sin used to fill that role or absent a personality like him, the sitting Archbishop of Roman Catholic Church. Some less developed nations, the military chief wears that hat even if he often abuse it. It is an irreplaceable loss for Singapore if we have an activist President because he will fail to perform the needed role of someone above and beyond politics at those critical moments. Our first President, Yusof Ishak performed that role with distinction going out to meet the people every day to unify the races and religions. It was a job politicians cannot do as well. An activist President will cost us dearly. If you want to be activist, go and get elected into Parliament. The Presidency is the wrong place for it. You will be forcing the government of the day to remove you from office. I am sure I have just gone over the heads of my kids reading this. But they are not going away empty handed. They will come back again and again until they learn it. They have had such experience many times, especially with conceptual Physics. Got stuck in bad traffic this evening on the way to dinner. The first time I got to crawl slowly under the ERP gantry near SOTA after stopping before it for sometime. Money paid but no smooth traffic. The luminous reflection off the bitumen (photo not doing justice to reality here) momentarily make you feel like you are on holy ground, and there you offer your "tithe" of $1. Just saw this is today's WSJ. What nonchalance among WSJ readers. They are asking for it. Sure there is fuse left to burn, but it will get to the bomb in due course. May be the pols won't be solving the problem and begin to shift toward how to pin the blame on someone else. That would of course be done behind curtains. Perhaps it has started already. Wonder how I would feel when I look back at this months from now. And here are some comments which attracted many recommendations. Let's be honest. Both parties have been on a spending binge, coupled with the down economy, and you have a real problem. I would like to see drastic cuts like the rest of us have had to make. Not just lip service which they BOTH are trying to hang their hats on. This is an embarrassing quest. They should all be ashamed. I would say... what good is a ceiling if everytime you reach it, you move it? Sounds rediculous to me! I wish I could do that with my income. Everytime I spend more than I have, I just move up my credit limit and keep going! We won't default, the treasury brings in 2.2T of hard earned tax revenues a year. That's enough to cover the debt interest, Social security, Medicare, the troops etc... Where the rubber meets the road will be unemployment, food stamps, student loans and other various government giveaways. It would be tough, but necessity is the mother of invention. It could force a government restructuring just like any corporation and maybe streamline government. That could be a good thing. Lastly, people need to stop saying Clinton balanced the budget. I like Clinton, but his budgets were balanced because Robert Rubin borrowed the difference from Social Security. The Treasury owes 3 TRILLION dollars to the SSA. It was another example of Ivy League Theory meets Goldman Sachs implementation. As we should all know by now; Financial calamity ensues! I'm not worried. It's a bunch of fluff. Stopping the gummit for a couple of weeks will illustrate how little it is really needed. What does default really mean here and why is it being applied? We may have a aortal government shutdown, but we can service the debt and so will pay our bills. With an income of 2 trillion or so and a debt service of 200 billion or so there is more than enough money. The only thing that is defaulting is the continuous paying of promises to special interests that in the long run cannot be allowed to grow without bound anyway. Default is the terminology of brinksmanship, not reality. The door bell must be the most taken for granted piece of equipment in the house, i.e., until it needs new batteries. OK. So here is the record. 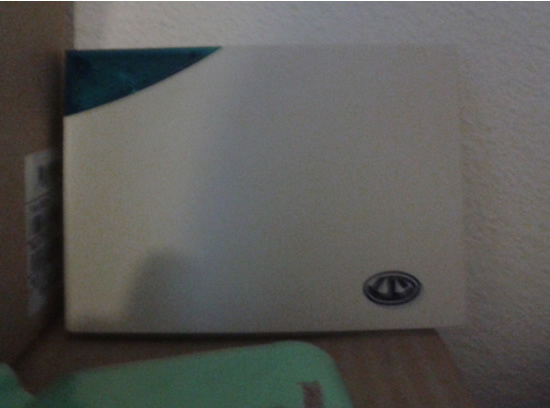 Let's see when I need to give it the loving attention of new batteries in future. This time I took the risk of replacing heavy duty batteries with alkaline ones as I am out of the more trusty type. I hope they don't leak. So I found someone who could serve as a mirror for me. I think it is prudent to be wisely stupid at this time by hoarding cash. The world is changing in ways where not enough people understand what is really going on to matter. If you are not positioned to stay cash, e.g., large institutions and SWFs, they do whatever it takes to stay alive because at that time, that is the only thing which matters. In the worst case scenaro, the euro suffers the ultimate crisis of confience; at the same time the USA defaults on its debts. Then like the end of the great age of the dinosaurs, only the small creatures were able to find hiding places to survive. I don't think it is going to get that financially and economically cataclysmic, but roughly that is the picture. If it turns out to be a real Armaggedon, then nothing truly matters isn't it? I can even forget about getting properly cremated. We will be talking about food, water and perhaps a rifle. The smart thing to do now would be to own farmlands. I understand Mike Burry is invested that way. The ex boss of my ex boss suggested the same in his book, "Wealth, War and Wisdom" - good to have a distant relationship, but no relationship isn't so good. Those who try to beat inflation do not know that they are taking on larger than usual risk like never before in the last hundred years. If Uncle Sam is determined to steal from you, it is really hard to avoid him. For now, and let's hope not for too long, minimize your losses. The uber rich with their many investing options think they are safe. I sincerely hope they are right. These are really interesting times when you see perfect asset correlation and liquidity vanishing suddenly. This is more meaningful than just saying CRASH! The stories all market signals give today are misleading because they do not have their usual meaning as the default risk of America is no longer zero as usual. Just got this video and I think this is just crazy. Responding to the video, why the market hasn't crashed is because it has no exit to run out of in order to crash. There is no alternative to the breadth and depth of the US treasury market. Guys will just have to hope for the best and stick it out like sitting ducks. That is why this is so surreal and precedents offer no usable lessons. Who knows, may be Obama would be forced to pull a make believe rabbit from his hat if there is no deal. He will achieve this by stretching the interpretation of the 14th Amendment and ordering Geithner to borrow money anyway, daring Congress to impeach him afterward. But you know, it is a really terrible idea to sail into uncharted waters. The money might be found this way, but the damage would be hard to repair. How would the ratings agencies respond? Denise Phua is one of the few PAP MPs I admire. This is what she posted to her wall last night. No hands, no legs - Nic Vujicic, motivational speaker. I sat next to him once at a seminar. I was in awe. You, Andrew Oh and 49 others like this. Jasmine J Goh Wow, amazing! I like his positive attitude. I hope to listen to his motivational speaking. Let me know if anyone know where he is goin to speak the next time. I like to attend. Jasmine J Goh Now, we have to feel for ourselves that we are LUCKY to have hands and legs. We have to make use of our capability to help MORE needed people. I want to help people too! I have been following the discussions. Some of the contributions are so typical of grassroots volunteers and leaders. They just want to do good for others, but my thoughts were quite different. I didn't want to add my comments to her wall as facebook is so much a "live the moment" platform. It is so gone with the wind and then you cannot call it back easily. I am pairing Nic Vujicic with Nitcharee in my mind. I am sure both of them need help from others to get around even if they can do many things for themselves. Sure, disabled does not mean unable but the laws of Physics have no respect for disabilities. Nic and Nitcharee have that sort of magnetism that cause you to want to help them. I wonder if we can train some of our disabled people to cause others to want to help them too. Perhaps it all begins with a sunnier than us attitude, but I am sure there are lots more I have missed. So this blog entry is a bookmark for me. I will be back. Update: Nitcharee is back in the news once more. People just want to help her. Some people just have this magnetism. As per my daily routine, I signed on to several websites in the morning, including my facebook account. Immediately I get information overload across the pages, but this morning something caught my eye. It was a post by Tan Kin Lian. He was referring to the latest blog post by "Yawning Bread". I decided to read this after having done with the latest update from Robert Kiyosaki, "Conspiracy of the Rich" update #92. The sort of activist president "Yawning Bread" is proposing doesn't sounds like a president that is able to unify the people. I have noticed there is no room for wisdom but instead pushing the limits for alternative agendas against the government of the day, which is also elected by the people. A President and Cabinet opposed to each other suggest a people that has become double-minded and unstable since both were chosen by the very same voters. What a quick and short road to perdition for this tiny nation. If I may borrow from the Roman Catholic Church, the President should be like God and the PM and his Ministers are the Pope and the Cardinals. God is acting invisibly, all wise and seeing. He is very patient, never have to worry about his reputation and foremost in his mind is the welfare of the people. Their welfare is his glory! His might is in his wisdom from an in depth understandings of the ways of the world and government. He looks far ahead and remind the government and people not to squander the intangibles of values and family under the pressure of short term gains and when faith is flagging. Fact of life is we will never have a President remotely close to being god-like in the Jewish, Christian or Islamic sense. But if you want a leader who is not under immediate pressure to perform and deliver, who is a protector of all things Singaporean, that is the best image. Just consider the times how the Roman Catholic Church had lost its way but was able to eventually return to the growth path. Nations have risen and fallen, companies too but the religions have survived, united by God or gods. Learn from them. Perhaps I do not know what will work well here, but I am sure an activist President will do Singapore no good. Parliament's hand might be forced to remove him even if push comes to shove. The reputational and execution damage to us would be overwhelming. This country would become even more divided. Therefore I have decided that Mr. Tan Kin Lian is not a wise choice for President. There are two, may be three Tans left to consider. As for Tan Kin Lian, he ought to have stood for election as an opposition MP candidate. Why he had opted to contest the Presidency, I cannot understand. Why are we here at all? Time has perhaps show that the innovation of the GRC system and the Elected Presidency are bad ideas. Before they can help us to avoid tomorrow's problems, they are causing big problems today. The folks who fashioned these ideas are proving not to be constitutional geniuses but just practical men solving bread, butter and security issues. They were wildly successful on that score. I only know that a horse can take you this far, but I am unsure where and what the "car" is to take over from the horse. I only know that if the WP ever gets to form the government, the GRC and EP will be abolished. Not a bad idea. Here is what one of my facebook friends left on her page. This is a civilized people. I am very impressed. Will Singapore get there? Not under the PAP, I am afraid. Also we are not a homogeneous society. The antidote for that is meaningful shared experience. E.g., both my daughters good friends in school are from other races. A german newspaper article says: "Even in their deepest sorrow the norwegians don't get hysterical. They resist the hate. It is amazing to see how politicians and the whole country reacts. They are sad to the deepest thread of their souls. They cry in dignity. But nobody swears to take revenge. Instead they want even more humanity and democracy. That is one of the most remarkable strengths of that little country." I was at Clementi Library to pick up a book I had reserved and noticed this when I was waiting for my turn. The last time I saw something like this was more than a year ago at SGH. I have never seen this before at Queenstown, Jurong East, Woodlands, Tampines, Bukit Merah, Cheng San, Bukit Batok, Jurong West, Bishan, Ang Mo Kio, Marine Parade and Toa Payoh. Just taking this opportunity to boast to myself how many libraries I have been. Something unforgettable must have happened earlier at this library. 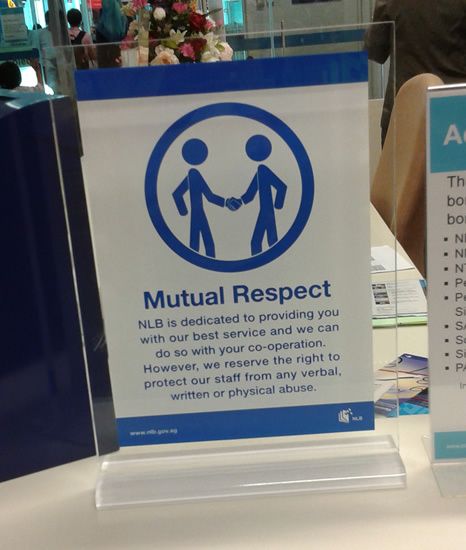 I shall keep a look out if they have this respectful notice at the other libraries! I don't care for soccer but Singapore beat Malaysia by two goals in 5 to 3 was good even if I haven't seen any photos or videos of the game yet. This compensates a little from what I saw in the front page of the Sunday Times this morning: the PM speech on transport fares. I would love to be the CEO of the public transport companies. Thank you PM for making our jobs easier. Don't be mistaken, the PM was doing them no favors. In their wealth trickle down philosophy, you pay the elites first. Even the feral American banks wait for the rain makers to bring in the money before compensating them, but here they get paid up front before they perform. Therefore ministers don't earn their spurs first, and SMRT and SBST do not need to improve ride experience before fares can be raised. They are defending fares increase based on a formula with the PTC. However common sense will trump any formula any day but it looks like they are going to ignore that. There is not enough wealth to trickle down because they have just incredible appetites. The $200 million in profits is too small. What a huge transfer of wealth up river. Gravity doesn't exists in this space, does it? At the end of the day, I am reminded that this is just one of a litany of examples that this government has lost its way. It has become so money minded. I imagine they are more concerned about the dividends SMRT and Comfort Delgro will pay to Temasek than the people's welfare. What they truly excel at is coming up with all sorts of ways to get money from us; and of course they always pay themselves first. Update: What happens when you put the commuters ahead. See the Taipei experience. Bye bye Queenstown Library. Too inconvenient to park there. 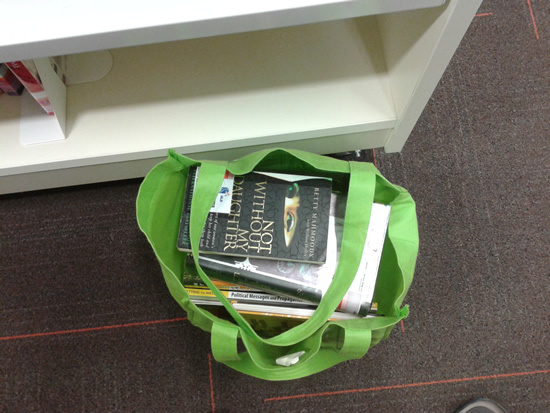 Today we begin to use Clementi Library seriously and look at the pile of new books we managed to take back with us! Double your loans is still on and that certainly helped to fill our bag. The veteran Transport Correspondent Christopher Tan has written a brilliant piece on the issue. 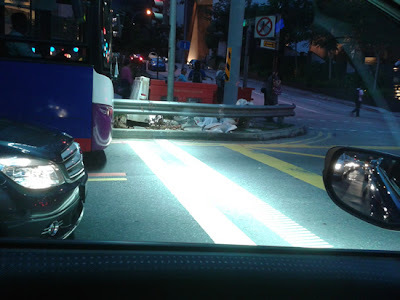 On the other hand the MOS for Transport, Josephine Teo, I felt I wasted my time reading her. This is not the place to tear up her argument paragraph by paragraph, and for my own sake later, I want to just remind myself how careless and thoughtless (sign of a shallow thinker or poor public politicking?) she had gone about using numbers. Reminded me long ago, my GP teacher came to class one morning and said, "There are lies, damn lies and Statistics". It was obvious to me she hadn't use numbers correctly here. She needed to provide more numbers from different perspectives and cuts or else look for one or two charts that captures the picture honestly and meaningfully. Now she has opened the door for her detractors to truck out all sorts of other statistics that will tell a different tale. This is irresponsible for the majority of lay readers because it only serve to confuse. Only a smaller segment of an increasingly sophisticated and young readers will see through this. This is simple and base public politicking "Yes, Minister" style (Think the BBC political comedy serial). No tables or charts of numbers from Christopher Tan, but a well written and engaging tour of the history and experience of public transport systems elsewhere. Robustly he concluded that what matters is how it is run. He didn't propose what is best for us, and I think writing for the MSM, we cannot expect more. We should be happy that he obviously didn't coordinate with the Transport Minister how to write his piece. My take is that we want the transport operators to put commuters as their number one priority. Problem is they operate under a structure where shareholders' and management interests rank ahead of commuters. As long as you stick with these priorities, commuters would be short changed. On this Gerald Giam had eloquently argued the truth. Since many public services are efficiently and effectively run in Singapore, it is understandable that the WP would propose a government run system. Had the public services been suffering a bad track record, nobody with common sense would suggest a National Transportation Corp to take on this job. I can't understand this government which just seem to enjoy getting us to "eat bitterness" all the time. It is as if they need to be constantly be reassured that we always maintain a healthy appetite for tough policies in order to ensure our continual survival in a hostile world. This is so self defeating. God forbid, but I beginning to wonder if in trying to brain wash us, they had also done it to themselves. Let me dig deeper before I round off this blog entry. This government is a sucker for the US Republican Party "trickle down" effect. It believes that the social compact between the upper classes and the rest work because as the shoulder and neck support the head, the head in turn pass down the bountiful fruits of their inspired and excessive output. Therefore if SMRT does well commercially, somehow commuters must benefit. However I imagine CEO Saw Phaik Hwa would spend more of her time focusing on stations retail outlets to improve the top and bottom line and leave the train system to her engineering deputies. She would do the minimum as per the regulators require from SMRT to keep them happy and spend most of her waking hours on how to leverage her retail experience cut formerly at DFS to please the shareholders so she can get her million dollar comp. Can we expect the best train rides from a CEO incentivized this way? What trickle down effect? All drains are blocked. There are no trickle effects. 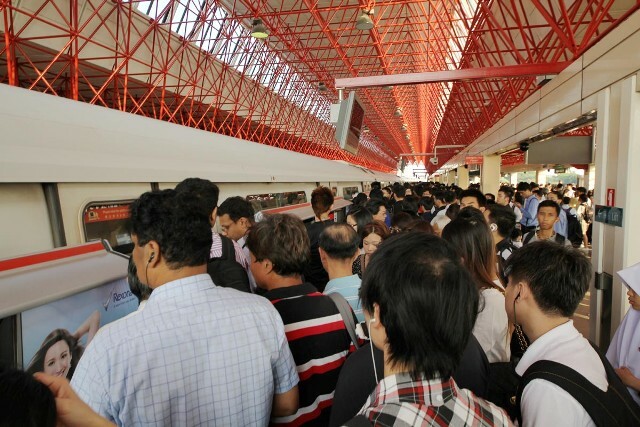 SMRT plan and lobby the LTA and Transport Ministry for rail and train expansion? You must be joking. Bonuses doesn't come from such activities unless you can live on compliments from commuters. This is a first for me. Returning from dinner, I found myself parked beside a car with two cute state flags adorning its wing mirrors. I bet the car owner didn't get permission to use the state flag this way. Just as well forget about the the no U-turn rule. Sim Wong Hoo publicly advocated that eleven years ago. He was right! This appeared on my facebook wall minutes ago. It just dawn on me, that the inchoate power of the people are, going forward, forming up more and more into laser beams targeted at policy makers. I can't resist reproducing one of the photos here. TOC has invited readers to send in their pictures of congestion in our public transport system. I am not sure how many will contribute pictures, and with smart phones it is easy to snap and upload photos. If the response prove to be tepid, it is only a matter of time enthusiasm will appear as long at TOC and others are patient. You can't hurry such things. Let the people self organize. This is happening all over the world courtesy of the Internet. Go and pick up some books on Chaos and Complexity if you want to understand such phenomena better. It used to be you give the government a mandate to run the country for five years and come back for another GE to be renewed or rejected. I think we are moving from "batch to continuous" process if I may borrow from my training as a Chemical Engineer. To the government this is rule by public opinion, which is anathema to them. To us, it is upward evolution or growing up. I don't know how this is going to play out. Change is time compressed (Oh dear, now thinking like a Physicist). Come 2016, it would be a completely different landscape. It is also too late for the government to educate the people especially if it is about tough policies. They have lost so much credibility with us. Just pick the latest. Compare how well Gerald Giam had argued his case against Lui Tuck Yew. The Transport Minister has so far responded with stony silence and try to focus on quality of service instead. I wonder if the people with their growing feedback power will try to help him refocus better. Both the price of tickets and service quality are equally important. The minister is only fighting fires but Gerald Giam has elevated the discussion to the philosophy of public transport and its long term sustainability. Now if the minister is not able to engage the NCMP as an intellectual equal, perhaps he ought to call his boss the PM to help him. If REACH cannot do a better job, they might as well retire it. It would be naive to think that the Presidency can remain beyond politics. Even in the British Monarchy, Prince Charles had often vexed Tony Blair with his very public advice on how to run Her Majesty's government. LOL. Well, we aren't British even if our governance is deeply rooted with them. My question: Is it possible to avoid the politictisation our Presidency when the position is an elected one. Once you open up for voting, you are as good as opening Pandora's Box. What's left is trying to dissuade the political ghost from escaping the box. Every candidate wants to win as surely as every newspaper also want to succeed with the readers and advertisers (Think Rupert Murdoch). What happened? Politictisation of the highest office of the land is no longer a matter of if, but when. The boundaries, yes, there is probably more than one clear black line on white ground, means we will always be testing the limits whenever there is a keen contest and bumbling into a broad swathe of gray. Before we know it, we had gone overboard and there is no returning. This office is easily damaged and very difficult to repair. I am two minds about the EP being a good idea. The British and most other places do not elect their monarchs. If we put longer term considerations aside, I detect that a large segment of the population wants an elected president as a short term response to send a clear signal to the government. It is a deplorable mandate hijack but obviously unavoidable. Don't bother to throw the constitution at the people. It is meaningless to most of us. That is also why national constitutions are often not honored in many countries. Ho Kwon Ping was more realistic and to the point than Wan Wai Yee. In fact, Mr. Ho would also qualify as a presidential candidate had he offered himself. Imagine how he might use the soft power of the office. Received this offer from Amazon last night. Later today, I hope to find some time to go kindle books shopping at Amazon! A very good chance I would end up buying nothing but it would be an enjoyable experience. This is coming from someone who doesn't really like shopping. Most times if I am out shopping it was because of wifey. I imagine how Amazon and Apple iTunes would compete with each other. They have contrasting strengths and weaknesses. Jeff Bezos at Amazon has the edge over Steve Jobs health wise. Google Books wouldn't how to make this cool, much less understand how and why people buy books. I first came across Michael Burry from Michael Lewis, "The Big Short" which my ex boss highly recommend me to read partly because there was a character that reminded her of me. This is Mike Burry from Bloomberg series on Risk Takers. It looks risky to outsiders who don't understand. A lot of fools go into the market believing that you only make money because you have assume the risk. They didn't know they were wrongly and badly educated. The financial industry loves this as selling to the clueless is always much easier than to the informed.